Please leave your comments and feedback here! You may leave a blog address in lieu of an email address, or no link at all if you prefer. I was just introduced to you through FB Socks for Soldiers group. I am loving what I am seeing here! Such pretty colorways. I've been a member of fiber club for almost a year and love it! It's definitely pushed me out of my comfort zone in a good way. I enjoy trying out different fibers and colors I'd never think of. Brooke's customer service is responsive and friendly. Will definitely commission the odd skein in addition to being in fiber club. I just got my yarn (Black Tulip Yakkity Yak) and it is Sooooo... beautiful. Have to search for a pattern to do it justice. Oh, my! I just found you, or rather my husband did! You are so close by! 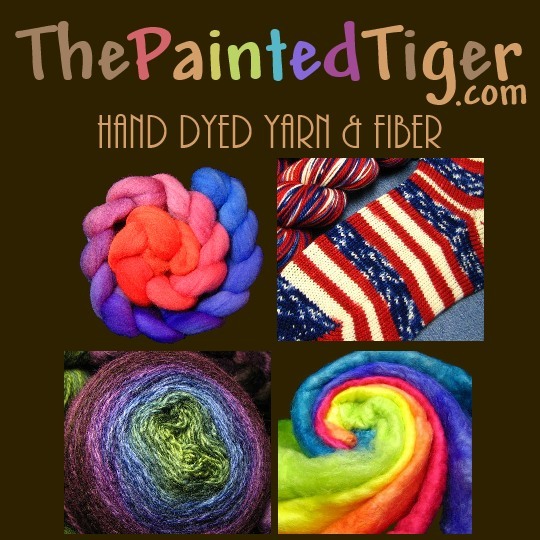 I have been knitting and spinning on my Lady Bug for years and now I have found a new love, The Painted Tiger! I will be probably ordering soon from your beautiful website! I took my Grand Old Flag socks to my knitting group today and your yarn is a huge hit. My friend Lindsay ordered 6 skeins so they could start socks like mine! Thank you for the awesome product and dyeing! I'm a loom knitter, and pretty early into it. I saw a video from Amanda Pratt and she was using Your hand-dyed yarn for socks. I am very interested in your beautiful colors but until I know I can actually complete a pair of socks, I really don't want to spend a lot of money on sock yarn. But yours is beautiful. ****************************** Hi Lani, Thanks so much for your kind comments! Congratulations on your new hobby. I generally knit my socks on a knitting machine, but I've picked up a sock loom for a portable project, also. It's fun, and easier on my hands than knitting with little needles. There are plenty of affordable sock yarns available online or in your local craft store to get you started. When you are ready for something special, I'd be honored if you chose my yarn! I got this beautiful yarn to make socks for my son David who is trying out for th US Olympic swimming team. My hope is he will wear them when he marches out on the pool deck in Omaha on Tuesday, June 28, to swim the 100 backstroke. I think of these as being prayer shawls for his feet. This yarn is beautiful, of high quality, and was a pleasure to knit with. Thank you for this great yarn! I received my "Grand Old Flag" yarn and had to CO immediately. My great niece recently opened a hair salon, Freedom Cuts, because she is so proud of her Marine son. These socks will be for her. The yarn is so soft and the colors so brilliant. Thank you for sharing your talent. Every so often, I run across a yarn that literally makes me do a happy dance, and your Rainbow Stripe sock yarn does just that. I cannot get over the vibrancy of the colors! Your quick shipping and attention to careful packing details speak volumes about how you value customer service, and the yarn itself is a real work of art. I am so excited, I cannot wait to cast on and watch my socks take shape in glorious color! Thank you so much! Another wonderfull skein of delicious yarn. I hate to untwist it.